Chris Gayle has been the engine of KXIP batting this season. From their season opening match against Rajasthan Royals to Saturday night’s RCB clash, he has been one piling on runs in plenty. Despite playing a match less, he’s breathing down the neck of fellow opener KL Rahul, KXIP’s top-scorer so far. Rahul has 337 runs in eight innings while Gayle has 322 runs in seven innings. He missed out on yet another IPL century, finishing unbeaten on 99 but was the main reason his team was able to put up a challenging total. The Jamaican is a slow starter but on Saturday, he made an exception – he sprinted to 48 off 23 inside Powerplay overs. He then slowed down in the middle, especially against the spinners, before bringing out the big shots in the death overs. He struck 10 fours and five sixes. KXIP were off to a lovely start with the openers milking 60 runs in the Powerplay. The introduction of spinners right after the fielding restrictions were lifted resulted in a choke. 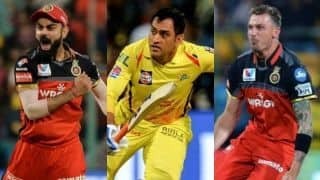 At the centre of it were RCB’s spinners – Yuzvendra Chahal and Moeen Ali. While Chahal attacked, Moeen contained and the strategy worked perfectly in containing KXIP’s scoring rate. The duo returned a combined tally of 3/52 from eight overs. Between over no. 6 and 15 during which the spinners were in operation, RCB allowed just 62 runs and picked four wickets. Not to mention, Gayle could only progress to 66 from 48 while consuming 23 more deliveries. RCB made a flying start despite losing Parthiv Patel in the fourth over. The pair of Virat Kohli and AB de Villiers then combined to take the chase forward, scoring boundaries regularly. They stitched a partnership of 85 runs although they underwent a slowdown with Murugan Ashwin applying the brakes with a spell that read: 4-0-24-0. Andrew Tye had also done well to keep the leash on in his first three overs which cost KXIP just 22 runs. Kohli scored his half-century but failed to accelerate and his dismissal in the 16th over worked in his team’s favour. 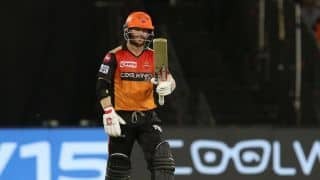 The equation was stiff – 44 off four when Marcus Stoinis walked in and the hosts must have been fancying there chances considering the epic collapses that have happened in the past during the ongoing season. Fielding was certainly not an area that KXIP would have been proud of despite taking the contest into final over. 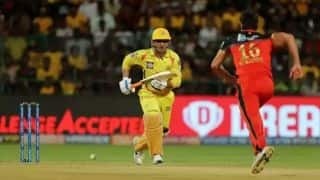 There were instances of several misfielding and a dropped catch in the late stage of the chase that could have potentially changed the course of the match. 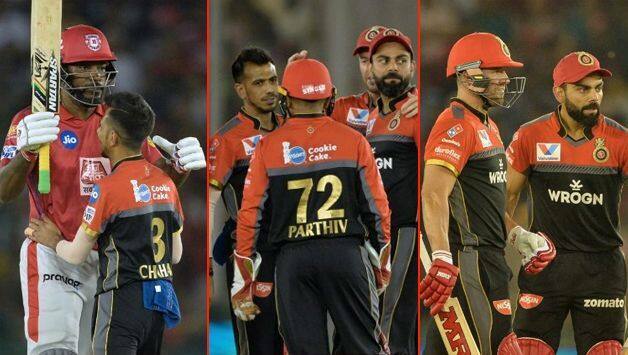 Tye had just come onto bowl his final over and had him belted for two straight fours by Stoinis who eased nerves in RCB dugout bringing down the requirement from 44 off 24 to 36 off 22. The Australia allrounder went for another big shot but got a top-edge which Murugan grassed. Stoinis finished unbeaten on 22 off 14 alongside de Villiers who completed fifty of his own to take RCB over the line.